ACT vs SAT – Which should your student choose? This is a guest post from Rachel Kapelke-Dale. Read her bio at the bottom of the post. As your student applies to college, one of the biggest decisions he or she will make is whether to take the SAT or the ACT. Although this may sound like a meaningless decision, it can actually end up having a big effect on admissions. Why? Because the two tests, for all their similarities (they are around the same length, around the same price), emphasize different skills. This means that, depending on your student’s strengths and weaknesses, it will most likely be beneficial to take one rather than the other. Here are a few things to keep in mind as you guide your student through the process of deciding which exam to take. The SAT went through a much-lauded transformation in 2016, but that doesn’t necessarily make it easier. 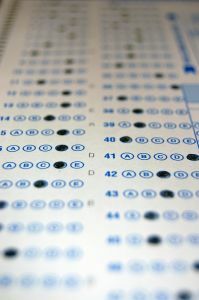 The changes it made emphasized its purpose as a reasoning test. The SAT tests analytic ability, particularly as it applies to real-world scenarios. What types of students should take the SAT? Students who like the classics, first of all—the test now makes use of historical documents in the Reading section. Students who are good at doing math by hand but don’t like science may also prefer the SAT; the exam has a no-calculator math section but does not have a science section (the ACT does). In terms of English, students who are good with graphics and analysis of texts will succeed here. And if you’re worried about point deductions for wrong answers, don’t be! The SAT doesn’t do that anymore. The ACT, on the other hand, is a content-based test. Its questions tend to be less tricky than the SAT’s—but the test gives less time in which to answer them. The exam is great for fast readers, particularly those who can read quickly without losing sight of details. If you’re worried about the Reading section, note that ACT passages are easier than SAT passages. Mental math wizards, take note: shortcuts are rewarded on the ACT. Yes, there is a Science section, but you don’t have to be a nuclear physicist to succeed on it, as it primarily tests scientific reasoning rather than facts. And if you like arguing, the ACT essay is a great place to show off these skills. A lot of students won’t fall clearly into one category or the other; what do you do if your student is great with graphics but is also a science genius? First of all, students should not take both tests, though this would seem to address the choice question. However, the trade-off is that in prepping for these two very different exams, students lose precious time they could have spent acing one of them. Instead, it’s worth taking two mornings to provide students with the chance to test out the ACT and simulate the SAT. It’s important to know that the scores for these “diagnostics” aren’t indicative of how far your student can go, only of where he or she currently is. The benefit of this is that you and your student will get a great sense of which test comes more easily to him or her, making test prep that much less stressful. At the end of the day, colleges that accept the ACT also accept the SAT (and vice-versa), so you can’t go wrong. Choosing the test that best shows off your student’s skills, though, will provide him or her with a great leg up on the test prep process. Rachel Kapelke-Dale is a High School and Graduate Exams blogger at Magoosh. She has a Bachelor of Arts from Brown University, an MA from the Université de Paris VII, and a PhD from University College London. She has taught test preparation and consulted on admissions practices for over a decade. Currently, Rachel lives in Paris. Taking the SAT one final time in hopes for a higher Math score?